There was an enormous protest against Supreme Court Justice nominee Brett Kavanaugh in DC the other day. Hack comedians , Amy Schumer and Lena Dunham, headlined the protest, with a guest musical performance by Alicia Keys. 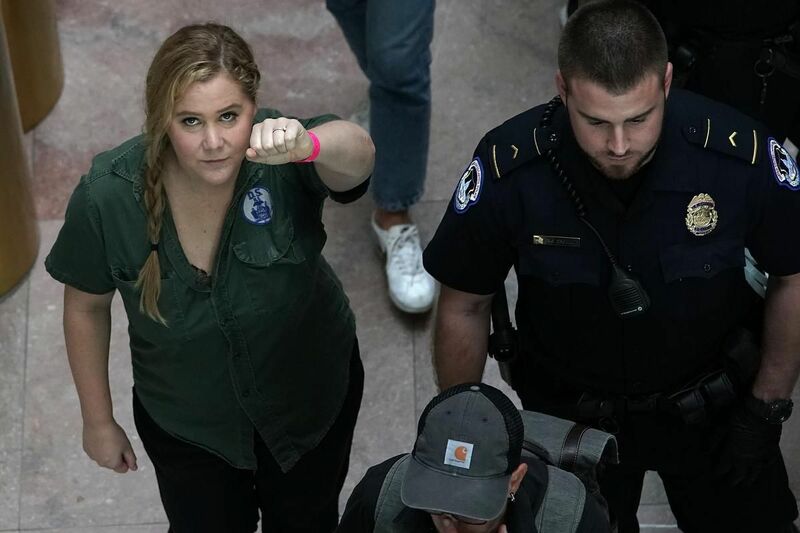 But it was Amy Schumer who got a huge wakeup call at the event that could destroy her career for good. Amy Schumer despises Trump and lets everyone know it as much as possible. That means that she hates everything he does by extension too, which definitely means Trump’s handpicked Supreme Court Justice nominee Brett Kavanaugh. That’s why they launched a protest called “The Bravery is Contagious,” to protest Kavanaugh because of his recent sexual assault accusations. Of course, things were hectic in D.C. that day because of irate liberals. At least hundreds of people turned up at the Hart and Dirksen Senate Office Buildings to convince Senators to vote against Kavanaugh. And that’s why it wasn’t all that shocking that Amy Schumer was among those that were arrested. It should be noted that she was “technically” arrested or detained. D.C. Capitol Police claimed they arrested 302 people during the demonstrations. She’s not some renegade liberal who really cares about any of this. That’s clear now. It’s a desperate cry for attention. She’s wants to feed this into celebrity. It may be that Schumer did this to get back in the good graces of Hollywood because she’s had several box-office bombs in a row. It might have worked too because many celebrities on Twitter called her a hero for this. This is all a gimmick. Brett Kavanaugh doesn’t deserves this. Hollywood’s attack on Kavanaugh is insanely ironic. The Me Too Movement exposed so many Hollywood elitists and yet they blindly disrespect Trump’s pick all of the time. It used to be innocent until proven guilty. Now it’s the court of public opinion. One of Kavanaugh’s fiercest critics is Stephen Colbert. But Colbert and CBS were just embroiled in an alleged workplace misconduct scandal. Do you see how Colbert refuses to take ownership of the problem? Colbert is not the boss but he’s definitely one of them. If he really cared then he would’ve just confronted CBS and gave them an ultimatum. “It’s either him or me,” he could’ve said. But all he did was talk about stuff in hindsight. Yet, these are the same people who ridicule Brett Kavanaugh when all of his allegations are unsubstantiated. This is a liberal coup to flip Congress in November and nothing more.